Monday, August 27, 2018 - Kakamega Senator Cleophas Malala is now officially off the market. 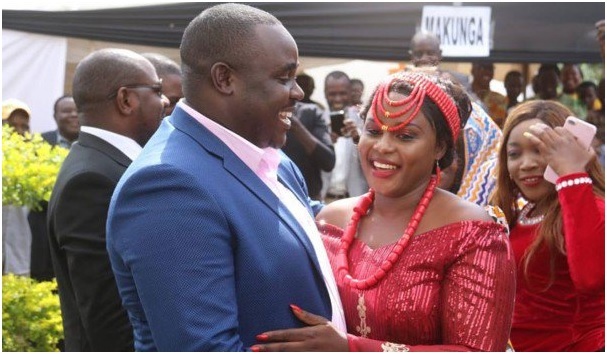 The vocal first time Senator re-affirmed his love for his beautiful wife and mother of his two kids by paying dowry for her in a colorful traditional ceremony held on Saturday. Malala had been staying with the beautiful lady but its official he has decided she’s the one he intends to spend the rest of life with. The former high school teacher and acclaimed thespian was however forced to pick out his bride from a bevy of beauties covered in lessos from head to toe during the traditional ceremony attended by several politicians from Western Kenya. The old tradition is meant to test the groom’s knowledge of his wife-to-be. “He who finds a wife finds a good thing,” explained Malala.